Every time people find out that I own a BMW, they inevitably ask with a smirk, So is it really the Ultimate Driving Machine? My response is always, Err... dunno. I like it a lot? Whoa, how is it that I dont know if my own car is the Ultimate Driving Machine? Well, its not something I can find out just by driving to and from work, or even on a twisty mountain road even. Theres just no way to push my car or me to the limit on public roads and still be safe. Then came my very first Track Day and now I can safely say that my car is, in fact, the Ultimate Driving Machine. My coworkers had been bugging me about going to the track even before I bought my bimmer. I wrote it off as something Id never have the car, time, or money for. But the seed was planted and I when I chose my car, I made sure it could hold its own if I were to ever drive it in a ... spirited fashion. A year passed and I began learning the ins and outs of my car. My morning and evening commute quickly became the best part of my day, the highlight of which is what I like to call the NVIDIA Autocross. Its basically an off ramp, on ramp, exit, and obstacle-filled parking lot all in super-quick succession. After negotiating the course every morning at fun speeds, I like to look around in the car and in the back seat and note how successful the morning drive was. If all items in the car have swapped places, or better yet, ended up wedged in strange configurations against the doors, I know Ive done my job well. After living the The best part of waking up, is squealing tires ... in your cup? mantra for a while, I began to have an inkling of just what my car could really do. We started organizing scenic drives up by Skyline Blvd which runs the ridge line and and is as gorgeous as it is fun to drive. Finally, Id had just about as much fun as I could driving safely and as legally as possible on public roads filled with other cars, people, curbs, dogs, children, hikers, bikers, horses, rocks, potholes, etc. Things were getting boring. The obvious solution? Go to a NON-public road, somewhere meant for driving and safe. Thunderhill Race Park was it. As my friend, Nick, so kindly demonstrated with visual aides, it was a driver-oriented track with very few walls and lots of grassy fields of happiness should I accidentally remove myself from the track. This was in contrast to places like Laguna Seca which have concrete walls of death everywhere to protect spectators. I was like a 12 year old with A.D.D. on crack the week leading up to Track Day. I was so excited I couldnt think straight. Every time I tried working on something (work, whats that? ), my mind would drift and eventually the sound of engines and tires would fill my head. I signed up with NCRC (Northern California Racing Club) who were incredibly helpful. They assigned a mentor, Dean, whose sole purpose was to answer as many stupid questions as I could throw at him. Finally, on Friday, Nick, Jason, and I drove up to Willows, CA and checked into our room. We talked cars for a while and general driving techniques before heading to bed. The next day started bright and early. We met up with our fourth, Lukito and drove off to the track. Lukito had only been to the track once and was going to be in my running group (we both would have instructors riding with us all day). He was driving his Galant VR4 a.k.a. POS Galant which is this vintage 1991 4WD car with 10% remaining paint, crappy tires, and ridiculous amounts of horse power courtesy of his manly turbo. 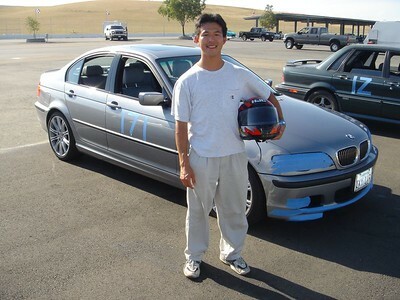 Nick (who got me into this mess) was beginner-intermediate and drove his Subaru STi. Its this 4WD silver thing with a ginormous wing in the back and huge hood scoop in the front. We like to call it Factory Rice. He also has ridiculous amounts of horsepower and very sticky tires and loves initial D way too much. Jason, the veteran of our group used to track his M3, but recently upgraded (or downgraded depending on your point of view) to a Lotus Elise which has a teensy weensy engine but drives like a go-kart. Lukito and I began the day with a quick classroom lesson on what the flags meant, when to go, when to stop, etc. while the big boys and girls with their GT3s, GTAs, Porsches, etc. went to play around on the track. Then it was my turn. I met my instructor, Jay, who is a moderator on bimmerforums.com, a site that I frequent. We hopped in my car and before I knew it, I was in the pit lane waiting to be waved onto the track. The first moment on the track was one of the strangest experiences ever. The track looked like a street and smelled like a street, but didnt go anywhere and i knew i was meant to drive ALL OVER it  the left side, right side, even the berms (curb-like things) and I was meant to do it FAST. I had no previous experience to tell me how fast or slow I should be going, or where to be on the track when. It wasnt long before I heard the tell-tale screeching of my own tires and ended up OFF the track. After being scolded like a little child by the track attendant, I pulled into the paddock and had a chat with my instructor. He decided to give me a ride in his E36 M3 race car to show me the line and speed to take through the track. Despite his going slowly for educational reasons, I still had the ride of my life. Driving on the track really is like having your personal roller coaster. Then came my second shot at driving the track. I was very apprehensive about going off the track again, so I decided to go really slowly, ignore the cars stacked up behind me (who I let pass at the straights), and concentrate on getting the line down. I was still missing every other apex and finding myself in strange places on the track, but overall, things were much improved over the first session. I even managed to stay on the paved part the whole time! I decided to take a break after that and caught a ride in Nicks STi just to see how a more seasoned driver in a faster car took the course. To sum up the ride, Id call it the grossest abuse of four wheel drive Id ever seen (yon WD!!!1). Wed go blazing into the turns with all four tires screaming and Nick would skid the rear end around so that it was pointed at the turn exit. Then instead of gently sling-shotting out of the turn, hed slam his foot down and claw his way out full throttle. The most exciting part was when we finally overtook a brand-new Lamborghini that wed been following for a few laps. We started out behind the it in the pit lane and Nick asked me if I thought he could pass it. I said no, probably not. A few laps later after watching the Lamborghini take several atrocious lines, I looked over at Nick and said, Hey, you know... I think you can take this guy. Nick just smiled. Then the next lap, we blew his doors off. Nick was done smiling and was busy whooping and laughing. As luck would have it, the track photographer just happened to capture the pass, Nicks victory over the Lamborghini was immortalized. Throughout lunch, we discussed our experiences up until then. Nick and Jason were having a blast, but I was slightly disappointed. My second run was good and consistent, but excruciatingly slow. I wanted to go faster, dammit. I was wasting the track. I resolved to fix the situation and psyched myself up, trying to shake off jitters from my earlier excursion into the dirt. I knew I could go so much faster, still be safe, and still stay on the track. I kept telling myself to stop driving like a sissy and to start driving more like I do in Gran Turismo 4. No more of this driving miss daisy stuff! On my third run, I made it happen. When I had enough available traction between the turns, my right foot was all the way down, my mind screaming for speed and my car obeying. Maintaining the line was my first priority and it held, but I definitely felt the rush of speed, especially coming out of the turns, down the straights, and the good hard braking before the turns. It finally felt like I was doing some high performance driving! My attitude adjustment was rewarded when I began passing some slower cars. I actually passed someone else instead of the other way around! At the end of the session, I came barreling onto the straight and who did I see in front of me? None other than my fellow newbie Lukito! The track event wasnt a race, but it sure felt good to know I was no longer the slowest person in the group. By the end of the day, I was completely overheated (it was 100 degrees all day long), exhausted, and my brain felt really really fuzzy, like it was made out of cotton. I sat in some more rides and drove two more sessions. When it was over, we packed all our stuff up, took some pictures, and removed the tape from our cars. We had some dinner and consumed gallons of iced tea, had some good laughs about the day, discussed our successes and failures, celebrated Nicks victory of the day, and then headed home, just four guys, our cars, and the sunset.